I have just started a brand new job – in the fast food industry – so new, in fact, I have have only been on the job for the equivalent of 3 days – 11 hours computer training and 12 hours practical training on food prep, beverage prep, cash, stocking, other shift duties, and food safety… I start full-time hours in a couple of days – and will get the balance of my practical training. When I had my interview, I was told that they needed a full-time afternoon shift supervisor – and that being shift supervisor also gave you fast track to being assistant manager. And that I had relevant experience for both jobs. I have customer service, accounting (both extensive), cashier, and supervisory (both median) experience. The person who interviewed me was the daytime assistant manager. Within 20 minutes, Anne indicated to me that she had spoken to the owner and that the owner had said that nobody got a shift supervisor’s position immediately. (Did I say that?) When Anne and I took our break, I apologized to her by saying that I was sorry if I had upset her – that that was not my intention. That I thought it was important to know extra because not only would it help me do my job better, it would also help me IF I were to get the supervisory job, knowing that it would take extra training and, at least, a couple of months if not longer. Anne indicated to me that she wasn’t upset; nevertheless, at the end of my shift, she said that I should not mention it to anyone else. I assured her that I wouldn’t. A couple of days later when I filled out the balance of my employment paperwork with the assistant manager, she mentioned that I shouldn’t be telling anyone about being considered for the shift supervisor’s job because the reaction was that other employees had asked, “Is someone going to be fired?” (Wow!) (The assistant manager was not at work on the day of Anne’s and my interaction.) I apologized to the assistant manager again explaining that my intention was to find out information so that I could do my job better and to prepare for the eventuality, but expecting that it would take time, further training, and not be an instant thing. I also told her that I hadn’t mentioned another word since Anne’s and my interaction. The assistant manager was very gracious. Of course, this has set up some red flags for me. I’m not sure that I understand why a new employee being considered for a supervisory position should be a secret? Being considered doesn’t mean that you have the job. Being considered means that you’re looking at a larger learning curve, extra training, and “harder” work (extra duties and behaving in an open-door manner to other staff). I think that the full-time afternoon shift supervisor’s position has already been offered to other employees – Anne, in particular. So, again, I don’t understand the secrecy. And, perhaps, this is jealousy or something similar? (Anne mentioned that she’d like to help the assistant manager out but that she couldn’t work afternoons.) 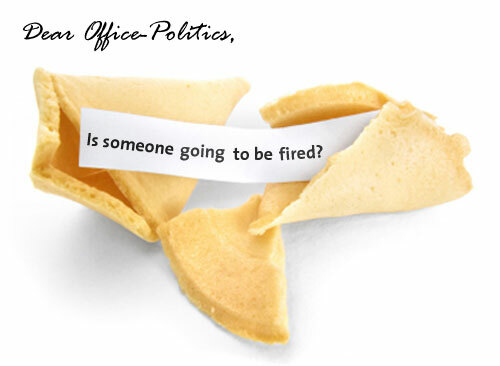 I feel that the “who’s getting fired?” is an overreaction but also an indication of something not quite right. Twenty-three hours is not enough time to hone down where the problem actually stems from – it could be a person, persons, or just generally, the “underpaid, overworked” environment that the fast food industry is supposedly about. Anne, too, is not necessarily the problem. She could also just be a symptom. I found her tightly controlled and some of her comments and reactions during training, particularly when talking about other staff, were not entirely appropriate. Should I stick this out? Yes, because it’s a brand new job and it could be just a bad period this workplace is going through. I have gotten the impression that they are slightly understaffed and deal with high turnover (which could be the particular workplace, but also, could be general to the fast food industry). The job also offers benefits – and who am I to turn those down? Nevertheless, I’m not sure I have the patience for this. I’m not terribly experienced at the “usual” office politics, mainly because I’ve worked temp contracts most of my working life. Being a temp contract worker doesn’t tend to threaten permanent workers – though you do deal with “you’re temp so you better perform big and be exceptional”. And, I’m an older worker – being over 55. As I’ve gotten older, my patience about some things has grown, whereas patience about game playing has lessened. So, what’s a girl to do? Do you have any suggestions about how to handle this – early on – before it becomes terribly damaging? What is your fortune in the fast food industry? I think you’ve analyzed your coworkers and your situation very well but I’ll add in my perspective, too. Your letter raises interesting questions about management opportunities for mature workers and also the perils of revealing your desired career path to coworkers. 1. Should I stick with the job? 2. Do you have any suggestions about how to handle this – early on – before it becomes terribly damaging? Should I stick with the job? The fast food industry is generally perceived to be low wage and short term. However many people do carve out successful long-term management careers in it. Also, in a recessionary economy, it’s interesting to note that some companies are doing well — and the jobs can’t be outsourced to China. McDonald Corporation’s global same-store sales rose 7.7% last month. (In the U.S., their sales rose 4.3%.) I mention this because you’re in an industry where some players are doing well. And that could yield good opportunities for you in the future. Your experience in customer service, accounting, cashier, and supervisory is extremely valuable. Also, as a mature worker, you have a lot to offer the fast food industry. So don’t let this initial glitch dissuade you from giving it your best shot. As you noted in your letter, turnover is high in the industry as a whole, and also in your particular restaurant. Ideally smart management could play a role in keeping employees and reducing churn. I think if you talked to people in the industry they would say they are in need of mature, experienced managers, and would treat them like ‘gold’ if they could find them. But to make yourself into that ‘gold’ employee you have to get the experience first. Obviously you are disillusioned by your experience so far. You thought you were going to be on a career path that could eventually lead to being an assistant manager. But now you’re in the middle of it and any mention of promotions and career paths is discouraged. What went wrong? 1. This is a short-term job to pay for school, etc. 2. I’m only working here because I have to. Your coworkers sound like they are working in a ‘job’, while you are developing a ‘career’. They are not looking further ahead than the next paycheck. You have higher expectations in life. (That’s good.) You expected that if you worked hard, and learned everything possible, that you would be promoted. You have a ton of skills and you’re itching to put them to work… Is your attitude realistic? That response is exactly what you wanted to hear, right? McDonald’s has a policy of promoting people from within. Certainly, Ash Vasdani sounds very happy, and that’s what you were hoping for – but that’s not your experience, so far? Whatever fast food company you’re working for, they don’t aspire to the same goals as McDonalds. I don’t mean to single McDonalds out, because there are many fast food companies that encourage career development, transparency in career paths, and promoting from within. And while this was true for Ash Vasdani, it may not be true for others in the same company. You need to find out which companies have the corporate culture that you agree with. Your current company does not appear to. Take a moment and Google your current company. See what news articles come up. This will give you a broader perspective on the company as a whole, and whether the location you’re working from is an aberration or the norm. Training period: Observe your coworkers. Develop your management style. If you do stay, my advice is to consider your time right now as a training period in the fast food industry. Once you have some experience under your belt you can consider moving to another company with a better – and clearer – path for job promotions and a corporate culture that you respect. Taking this ‘training’ attitude can help relieve a lot of the tension. Each day when you go to work there is a purpose in why you are there, and why you are putting up with this job. You are #1. Gaining experience, #2. Developing your management style. On the other hand if you really don’t have the patience to put up with this job, I would still suggest you explore other opportunities in the fast food (hospitality) industry. You have many skills that could help you to be a valuable employee, manager – and maybe even franchisee. In closing, I would also offer the advice (which you already know) that you keep your career ambitions to yourself. They are threatening to your current coworkers. It shouldn’t be that way but it is. Jealousy and territorialism is a reality in some workplaces just as it is in other areas of life. Focus more on ‘doing’ than saying. Management – if they are any good – will observe your dedication and hard work and doors will open for you. Be your best. Good luck. Thanks for writing to Office-Politics. Brilliant answer – and brilliant tag – fast food indigestion! Thanks so much – I laughed. And yes, I certainly will be keeping my head down about mentioning my ambitions, my expectations, and my possibilities. I’d already decided that I was giving this a go anyway (both the job and the “secrecy”). But I think that openness works much better than secrecy – and so, when I become shift supervisor/asst manager/(or even!) manager, I’ll be implementing that with graciousness, politeness, and a (my typically huge) smile. As my duties grow (and they will – if for no other reason than I will make it happen) – and I then go onto training duties – I’ll teach new and existing employees that starting with a smile is the best thing they can do – sets the customer up – and even when a customer is badly behaved, starting with a smile helps staff end with a smile. Next ambition is to get to head office and teach them how to train way better – not that the training isn’t too bad – but has room for improvement. Sounds terribly ambitious, doesn’t it? As it turns out, I have a masters diploma – how about that for underemployment! I already know that I can make their online training more focussed (never mind the practical training) – and, in turn, can set up new employees to “hit the ground running” – which is what all education should be. (Ditto for upgrading and new training for existing employees.) The better the training, the better the employees, and therefore, less turnaround – even for summer students – they’ll be more likely to return summers if their experience is good. Though much turnaround in the fast food industry is blamed on low wages, poor breaks time, customer rudeness, and things like that, in truth, high turnaround is always to do with poor management. If you treat the employees like gold, then they’ll treat the customers like gold. And, of course, that includes treating managers like gold. Openness, good training, “real” motivation, and appropriate follow-through creates the right atmosphere – when that’s done within an organization, then it spills over the counter. So, I’m going to smile all the way through my “indigestion”. And, again, thanks so much for your time, great advice, and fabulous humor.